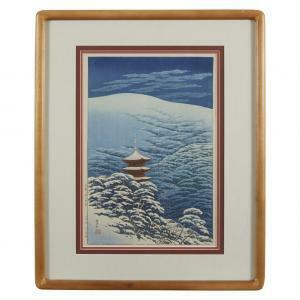 Find artworks, auction results, sale prices and pictures of Kawase Bunjiro Hasui at auctions worldwide. 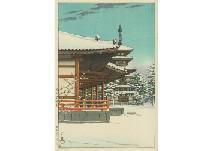 Yakushiji temple, Nara KAWASE Hasui (a set of 3) woodcut, 36.6x24.4cm, signed and sealed on plate, sealed "WATANABE" on plate, this lot accompanies other works; 【Snow in Shiba park】(woodcut, 24.1x36.4cm, signed and sealed on plate, sealed "WATANABE" on plate)【Onjuku, Chiba】(woodcut, 24x36.4cm, signed and sealed on plate, sealed "WATANABE" on plate). 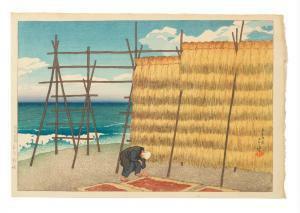 KAWASE HASUI (1883-1957) Two woodblock prints Comprising: 1. 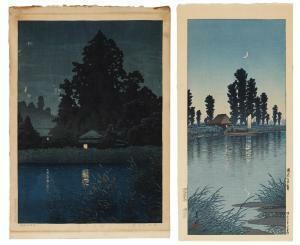 Itako no yugure (Twilight at Itako), published by Doi Sadaichi, 1932 2. 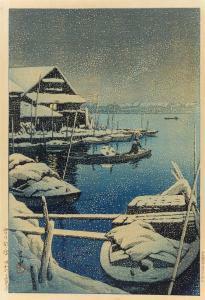 Ame no Omiya (Rain at Omiya), published by Sakai and Kawaguchi, 1930 3. Shiobara arayu no aki (Fall at Arayu hotspring in Shiobara), published by Watanabe Shozaburo, 1920 1. 40 x 19.4 cm. 2. 43.5 x 30 cm. 3. 38 x 26.2 cm.